American Buttercream as it’s called, is one of the simplest frostings you can make, but I thought I’d post both pictures of both my success and a fail so you could see the good points of this frosting along with the bad. And that frosting I tried to make cute little ghosties with was so, so bad! American Buttercream is fast, easy, inexpensive (and safe) and can be spectacular and versatile – it goes so well with any chocolate as well as fruit flavors – think how this would be on strawberry. And while not absolutely traditional, think about topping something Red Velvet with this frosting. I had a bit of a Pinterest fail when I couldn’t get the frosting right for the cute little ghosties – but I think I recreated Donald Trump! On the downside, American Buttercream can be cloying, but there’s a little trick for that. Instead of using milk in this frosting, use cream. It rounds out the flavor and enriches the frosting – and while we’re not talking about a lot of cream, trust me, this makes a difference. Mine was too cold when I frosted the ghosties. And I was a bit out of practice with this frosting. That’s because I’ve been using my blogging buddy, Carlee’s White Chocolate Frosting in almost everything for the last few months! So I thought I nailed it, but obviously not, lol! For best results with a buttercream, you’ll want to have your butter at the cool side of room temperature, which by definition is 68 to 72 degrees F. The closer to 68, the better. The butter should hold its shape when bent without cracking or collapsing. I like to put my butter out the evening before and I don’t always put it in the kitchen. In the summer, I know my lower level is just a bit cooler and in the winter, when I turn my thermostat down at night, I’ll put the butter on my gas stove with a bowl over it, to catch just a bit of that heat from the pilot light. When the butter is beaten, which is always the first step of the recipe, make sure that it is beaten enough to lighten in color and increase a bit in volume. That’s when you know it’s just right. This process actually warms the butter up a bit. Then you’ll add the sugar in stages so it mixes well. If the sugar is a bit clumpy, you’ll want to measure and then sift unless a recipe specifies otherwise. As far as the powdered or confectioner’s sugar – just like flour, it can be a bit drier in the winter; you’ll need to adjust the amount of cream in the recipe to smooth out that buttercream and get it to the perfect consistency. That’s a judgement call – you may need less or more than a recipe calls for, but when your spatula runs through the buttercream, it should be smooth and fluffy, but leave a bit of a trail that’s distinct just like you’ll see it when you pipe. Buttercream will also thicken up just a bit as it sits – unless it’s too warm. If you go too far, you can add a touch more powdered sugar. When deciding to use this frosting, think about things like where you’ll be serving it and how it’s being transported. This isn’t the frosting to have on a cake or cupcakes that are sitting out on a table on a hot summer day or tossed in the back of a car with the sun beating down. Using half butter and half shortening will help keep the buttercream a bit more stable and a lot of bakeries use all shortening. Also be aware if the temperature is too cold, the buttercream will stiffen and harden just as butter will. If refrigerated, you’ll want to bring back to room temperature. Butter at about 68 degrees F. It should bend and still hold its shape. Beat butter until lightened in color and increased in volume. Add sugar in stages, and if sugar is clumpy, measure and then sift. Enrichen with cream, using enough to lighten & thin out the buttercream. A trail should be left by the spatula. The amount of cream is a judgement call. Don’t expect this buttercream to hold up in hot weather. If butter gets too soft in warm temperatures, so will buttercream. Subbing half the butter with shortening will help buttercream hold up to warmth a bit, but don’t expect miracles. Buttercream can also be too cold. If refrigerated or kept in a chilly place, bring back to room temperature. Cut butter into chunks. Using the whip attachment, whip butter several minutes, scraping down occasionally, until butter has increased in volume and lightened in color. Add half of the powdered sugar and mix on low-speed until incorporated, again stopping to scrape down. Add the vanilla extract and mix to combine. Add the rest of the powdered sugar and beat on low-speed until sugar is incorporated, again stopping to scrape down as needed. Increase speed to medium-high and beat for 2 to 3 minutes. Turn back to low and add the heavy cream by the tablespoon, starting with a tablespoon or two, then adding more if needed. Turn mixer up to medium high and whip until light. This entry was posted in Click here for Fabulous Food Posts and tagged Buttercream, Desserts, Frosting, Frugal Hausfrau, vanilla buttercream. Bookmark the permalink. Can I know the recipe for the chocolate cake ? 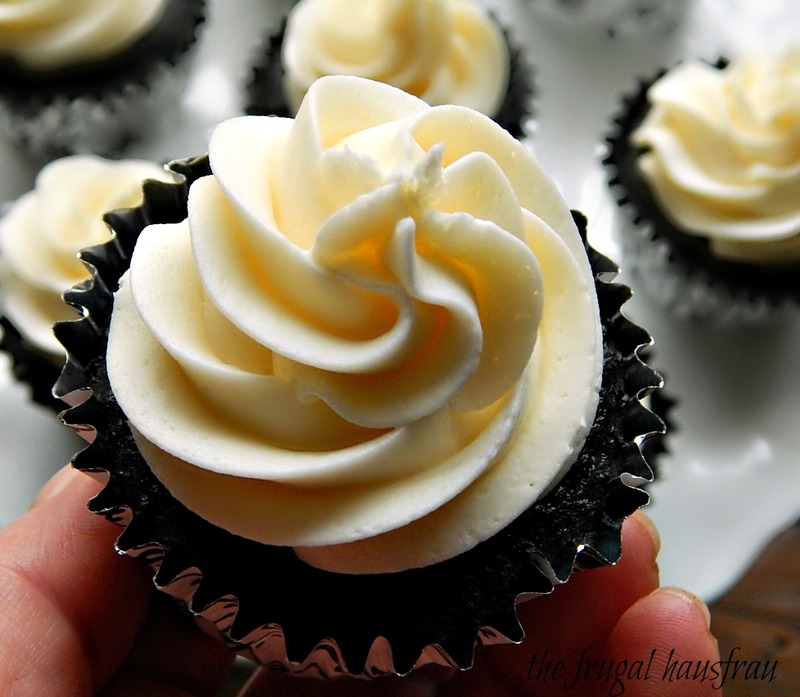 Really good tips for nailing the best buttercream. It looks so good.. Thanks for sharing this with FF. My pleasure! I think too many bloggers only post “perfect” stuff! Well here we usually just eat all the evidence, lol!! I know, right?! Think of how incredible that would be! The best cooks come to Fiesta Friday and from all over the world! 🙂 I’d need to wear my fat pants!!! These cupcakes look amazing, they’d be a hit for one of my dinners.. The ingredients are simple but finicky, it appears! Oh, it’s a simple frosting – but all frostings have their little quirks. This one normally isn’t so finicky, but I thought it might be fun to use my little fail as an example. Chocolate cake with vanilla frosting is my favorite those cupcakes look spectacular and I will use that recipe next time I make it. I think you’d like it! 🙂 Those cupcakes with that hot coffee – it just makes them soooo good!